I don’t know about you, but somehow my sets of wine glasses always end up getting broken, leaving one or two odd ones, but never enough for setting the table. So I rather like the trend these days of flipping over one or more wine glasses and using them as candle holders. This is a simple idea and won’t take you very long to put together, yet it gives you tons of scope for creativity. Want elegance? 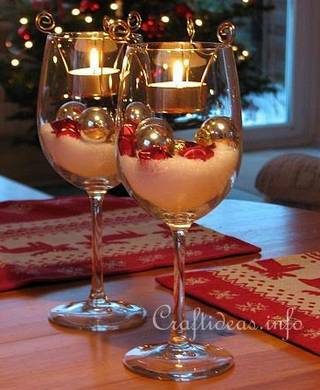 Fill the wine glasses with Christmas balls accented with glass seed beads or fine glitter. Sticking with a color theme this year? Use a variety of small ornaments in monochrome shades. For this project, I recycled a narrow stemmed wine glass with a green stem and a brandy snifter that was otherwise collecting dust at the back of the glassware cabinet. 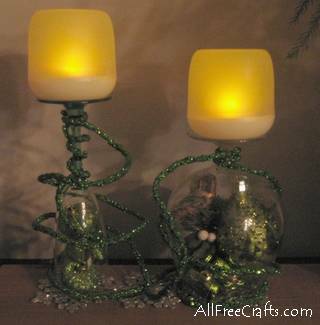 1) Fill both glasses with an assortment of small Christmas ornaments and jingle bells. 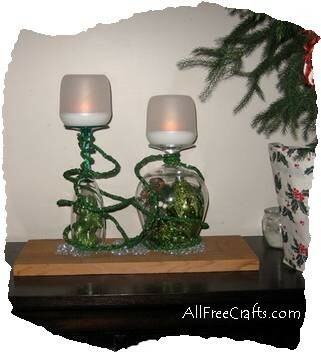 2) Place a snowflake ornament on top of each glass, then flip the glasses over. For a permanent display, remove the snowflakes and run a bead of hot glue or craft glue around the top of each glass before setting the snowflakes back in place. 3) Apply more glue on top of the snowflakes, then invert each glass on top of your base. I chose to glue a third snowflake in between the two glasses, tying the display together. You could also place a small pick of evergreens and berries in between the glasses. 4) Beginning with the glass on the left, start winding the wired glitter rope around the wine glass stem, then spiraling around the bowl of the glass. Bring the glitter rope toward the back of the design, then begin spiraling it up the bowl of the glass on the right and finishing with a tight winding of glitter rope around the glass stem. You can cut the glitter rope at this point or continue draping it in loose circles around the glasses. 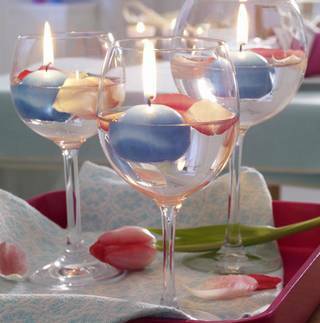 5) Switch on the LED candles, or light the tea lights, and place one on top of each wine glass. There you go: a little glitz and glitter topped with candlelight for Christmas. After putting together this display, I wanted to see what others had done along the same lines. 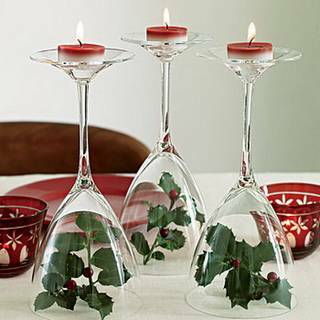 I think each one of the following wine glass candle displays is beautiful, inspirational and easy for anyone to copy for their own Christmas decorating. Wine glasses inverted over holly twigs and berries then topped by two-toned tea lights add up to a festive focal point with no fuss or bother. Candles and rose petals floating in pristine wine glasses provide a romantic note for an intimate Christmas dinner. Fake snow, shiny baubles, and golden tea light holders suspended from the center of large wine glass bowls. Sweetly simple. 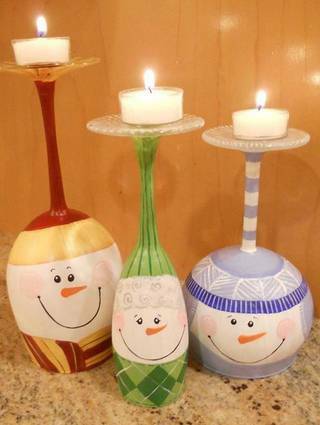 Use enamel glass paints to make your own Wine Glass Snowman Candle Holders and add some whimsy to your Christmas table.